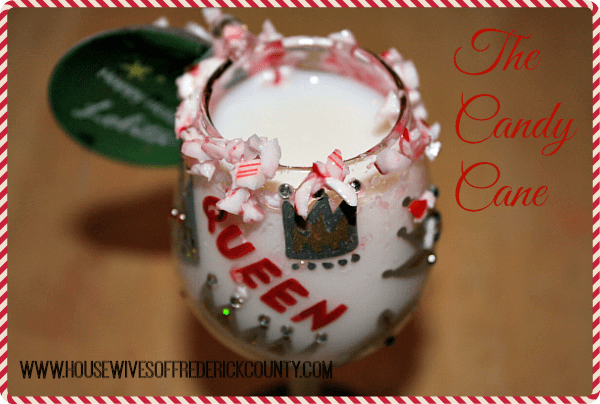 The Candy Cane - The Perfect Holiday Drink! 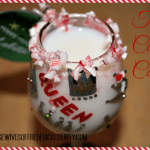 The Candy Cane – The Perfect Holiday Drink! OK, we’re not talking about kids’ treats, boys and girls. This is a festive, yummy potent potable (thank you for that term Alex Trebek!) that is perfect for serving at any holiday party! Thank you goes to Fancy Napkin for the idea! Notice the shot glass I used is actually a Christmas ornament that I got as a gift one Christmas! This little concoction is SO simple to make, it’s almost dangerous! Crush candy canes into tiny pieces (I did this by sealing a candy cane in a ziploc bag and then crushing it with a mallet). Pour the crushed candy cane onto a plate. Wet the rim of a shot glass with water. 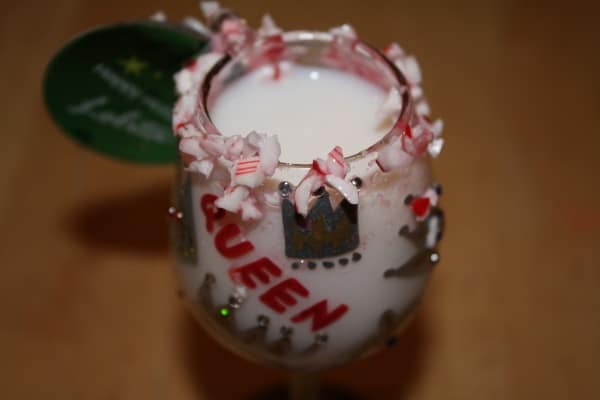 Roll the rim of the shot glass into the crushed candy cane (at first I had a hard time getting the candy cane pieces to stick to the rim, but once it became sticky there was no problem). 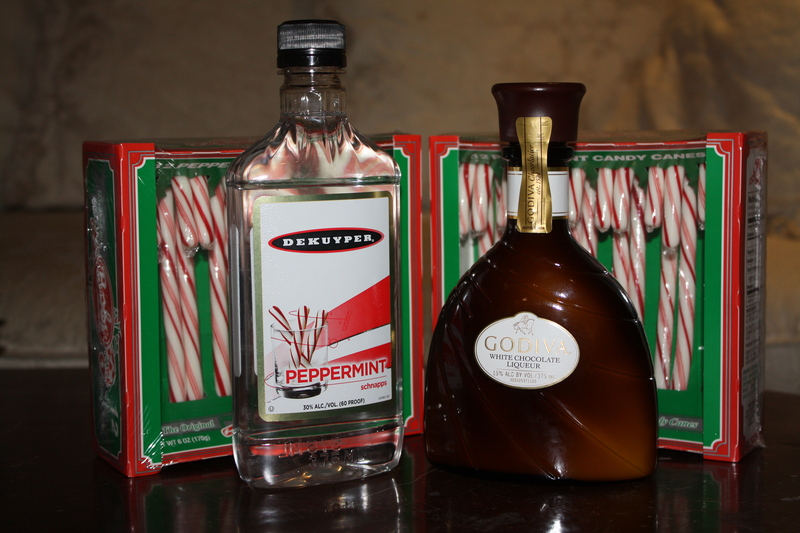 Pour equal parts of Godiva White Chocolate Liqueur and Peppermint Schnapps into a shaker. Pour into the shot glass. Make sure that your liqueurs are cold – makes it SO much better! Even though it will be cold, this drink will warm you up on a cold December night! If you’d like to serve these at a party, you could coat the rims of the glasses ahead of time and then pour the shaken liqueurs in each glass right before serving. Your guests will be quite impressed! Enjoy! What’s your fave cocktail during the holiday season? 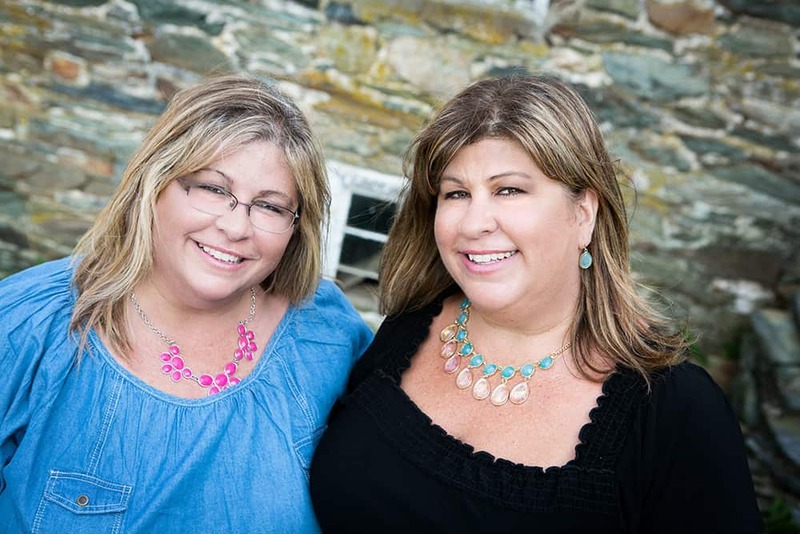 Awesome tip Katrina – thank you!! I am, sweetie, I wrote this post  It may have come up as Pam though.